The first step started in March 2011, that was made an action! I made a credit card. Why? Because the credit card could be used to book an Air Asia online tickets (www.airasia.com) and it could be useful in emergency situation abroad. 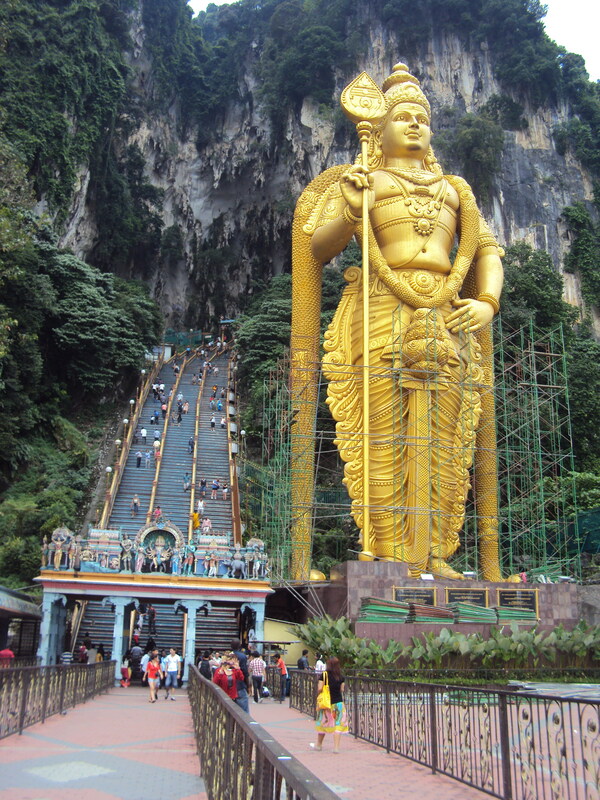 The first destination was Kuala Lumpur, Malaysia. The flight ticket that I booked for September 30th, 2011, was from Kuching (Malaysia) to Kuala Lumpur (Malaysia). The price of the ticket was 83 MYR (including airport tax, fuel surcharge, convenience fee, pick a seat, and luggage). Then, I booked a flight ticket from Singapore to return to Indonesia. I chose the flight to Bali with the price of 116 SGD. They’re booked in June 13th, 2011. I thought it was safe to buy a round trip ticket, although I can’t go to another destination. 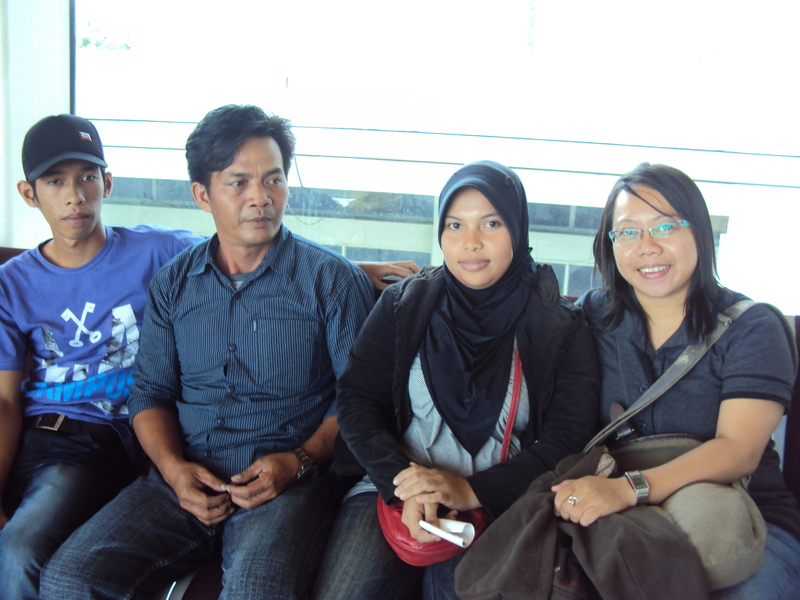 And in the following month I booked another ticket to return to my town, Pontianak. I booked Air Asia from Bali to Jakarta (546.000 IDR), then Lion Air from Jakarta to Pontianak (843.300 IDR). I booked accommodations in Kuala Lumpur and Singapore. The third and the fourth steps were spent my salary and then went to money changer to exchange Rupiah into Dollars. It’s time to learn to survive! I live in Pontianak which laid on Borneo island, so that I can go to Kuching-Malaysia by bus. I chose Tebakang Express for 168.000 IDR. Honestly, I was a little bit nervous for the trip because I’d go to a strange place that I never thought. There’re some things that I should keep in mind: ‘be brave’, ‘keep aware’, and not to be shy to ask about something that I don’t know/understand’. Those are the keys. The departure time was about 10 PM. Bus arrived at the border early, so we should wait until the border opened at 5 AM. After that we had to stand in line to finish the administration. Continued the trip to Kuching. I arrived in Kuching at 11 pm (Malaysia time), then I looked for a taxi to the airport. The taxi cost was 26 MYR. It’s my 1st time using Air Asia flight. So, I needed to learn and try “self check in” machine. First, I observed other people using the machine, and then I tried by myself. It’s the new experience. Yayy! I enjoyed the situation in the airport. I saw some European, Japanese, and many people bringing big backpacks and travel bags. Observing their attitude. It’s so interesting. I met 3 friends that looked confused. I started to say hello and talked to them. Yes, they were confused. They didn’t know how to check in and many things. Then I offered them some helps. I told them what I know. Then we made friends. Waiting for the flight for four hours made me a bit bored. I walked around the airport, did chit chat with other passenger to make us smile and laugh, then I slept a while on chair in the waiting room. Zzzzz…..
It’s time to the next trip. The departure was about 01.55 PM, then arrived in Kuala Lumpur-Malaysia at 03.35 PM. The flight was delayed, so we arrived late, it was about 04.30 PM. Arriving to the airport…hmmm, I was nervous, a bit confused. I didn’t know what I should do then. I read a book that I made to be my guidance book. Take a breath… then I walk outside. I looked around. I looked at some taxies and buses. Then I asked myself which transportation that I could use. After that, I asked some officers to find the best way to reach my lodge that I booked before. 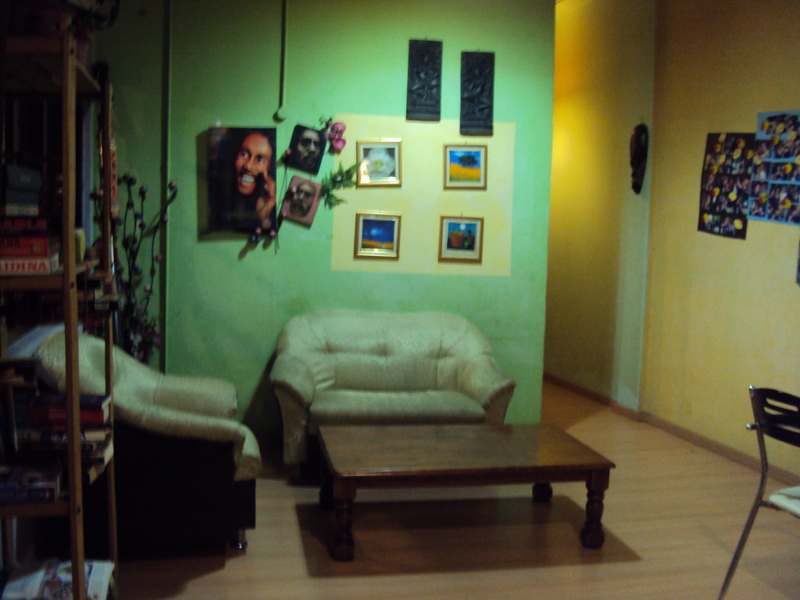 It’s Green Hut Lodge in Bukit Bintang, 25 MYR per night (female dormitory). And, finally I found good bus service. It’s Star Shuttle Bus, 18 MYR. After the bus came into the city, we should move to the minivan. The reason why we’re moved was our traffic lane in crowded and busy area. There’re traffic jams everywhere, so it’s easier to use smaller car. “Here’s your lodge!” said the driver. Fuuuhh (*sound of exhaling breath)… I arrived in front of my lodge. I was lucky to have a good friendly driver like him. “Have a nice vacation” he said as the last greeting. “Thank you for your help, Sir.” I replied. “English time…” I talked to myself. Lol. I entered the lodge. There’s a friendly Indian receptionist accepted my coming. She gave me the room key and told me that my room was upstairs. I walked into the room, locked off the door, opened…and I saw there’s a “bule” lying on her bed there. “Bule” is the way of Indonesian people to call foreigner, especially for European, American, and Australian. “Hi…” I said to her, and she replied friendly. I booked a female dormitory, so there will be more than 1 people in the room. The principal in dormitory room is we should share many things. We also respect each other. Friendship was started. My first foreign friend is French, named Sophie. We talked, laughed, and discussed many things in the room. She offered herself to be my guide. It’s nice! The first night in Kuala Lumpur. No, I didn’t go anywhere. I only went to Alor street, near my lodge. There are so many street foods. I was confused because didn’t know what food I wanted to eat, too much food. I decided to buy soya ice only. Lol. The second day, I went to some places with Sophie on foot and by trains. We walked from Bukit Bintang area to Kuala Lumpur Towers, and then we went to KLCC (Kuala Lumpur Convention Centre) area and Petronas Twin Towers. We were not lucky, because we couldn’t enter Twin Tower at that time. So, we couldn’t see how the tower looks like inside. People said that there are so many interesting things inside. We also can view Kuala Lumpur city from the towers. Sophie and I only sat on the floor to took a rest in front of the towers. After we took a rest about 30 minutes, we went to Jamek Mosque by Rapid KL trains (1.20 MYR). We walked around to Tuanku Abdul Rahman Street, Pelating Street (China Town), Little India. Those places sell many kinds of traditional food and interesting low price things. But, I didn’t buy many things there. I only bought some souvenirs for my office friends. Well, they said, “Don’t forget to bring something, Olla!” I’d decided not to buy many things in traveling. So, I only bought small things that easy to bring and not too expensive, but memorable. After looked around the streets, we returned to the lodge. “If you want to walk around in Kuala Lumpur with limited budget, you’ll only need good map, liters of mineral water, and strong feet. As I did with Sophie, we walked. A bit tired, but it was very fun!” I suggest you. 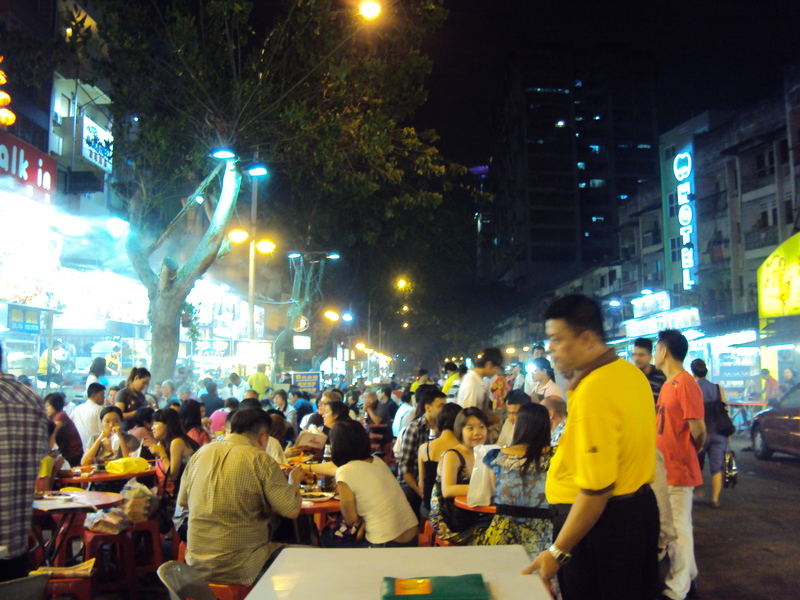 At night, Sophie and I went to Alor street for dinner. We sat in front of Chinese restaurant that had no costumer. 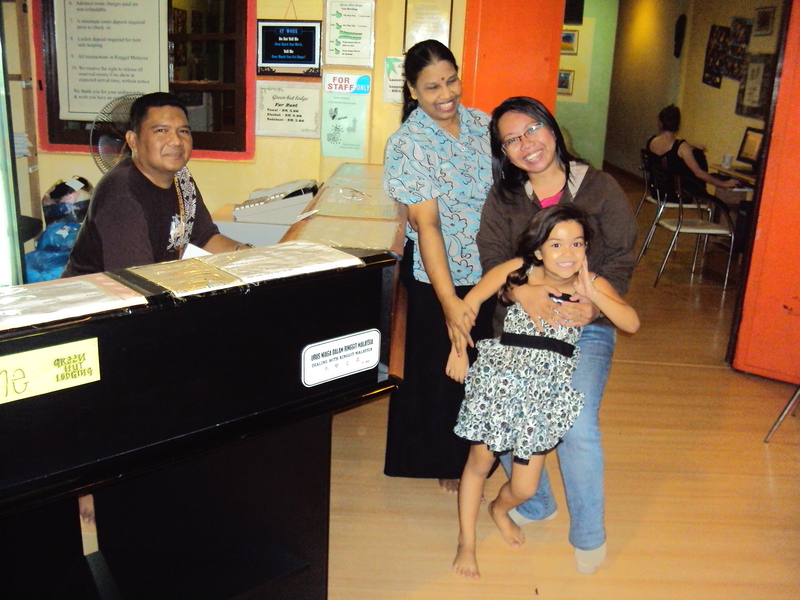 It was different with other restaurants that had many costumers. I don’t know what brought us to choose that restaurant. Sophie bought Cap Cay with lemon tea ice, and I chose bamboo shells (35 MYR) and fresh coconut water (6MYR). The shells called bamboo because it’s look like bamboo. It was very unique delicious shells that I’d never tasted before. About the lodge. I found it on hostelword.com. Green Hut is a simple nice one for me. I like it. The owner is a Danish woman who got married with Malaysian. The cost was 25 MYR, including breakfast (bread with jam, coffee, and hot tea) and free internet access. 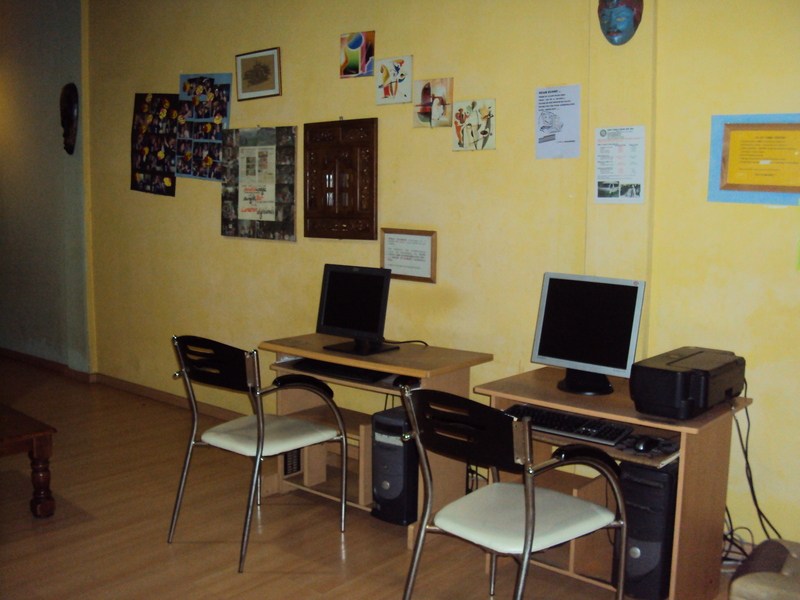 There are three computers in the comfortable rest room that could be used for chit chat and gathering with other travelers. Hey, the lodge has WIFI also. So we could be online from our room. In this lodge, I was lucky. I felt comfortable and could sleep well. It was different with some friends who have other story. They felt itchy because they were bitten by bed bugs. Check this out http://www.thegreenhut.com. When I sat in the living room, I met a nice cute guy. He was from Austria, but works in London. He came with three friends. We talked and shared experiences. There was one thing that he didn’t like and he shared it to me. He told me that there was a friend of his friend who joined them in the trip doesn’t like to go out nor tries a good thing. He went to many countries, but doesn’t interest to go out, don’t like to try traditional food. He only stayed in the hotel and ate Mc Donald. The third day. I went to Batu Cave by myself. I asked the receptionist, and she gave me the instructions how to go there. By train. It’s the keyword. First, I used monorail from Bukit Bintang to KL central (2.10 MYR). And then, I walked to Kuala Lumpur Sentral Station. It is a big station than we can exchange train. I had to use KTM Komuter trains to reach Batu Cave, it’s only 1 MYR. KTM Komuter train is cheaper than Monorail and Rapid train. Malaysia has good transportation, for tourist. They also use English for sign, so traveler can understand how to go anywhere. 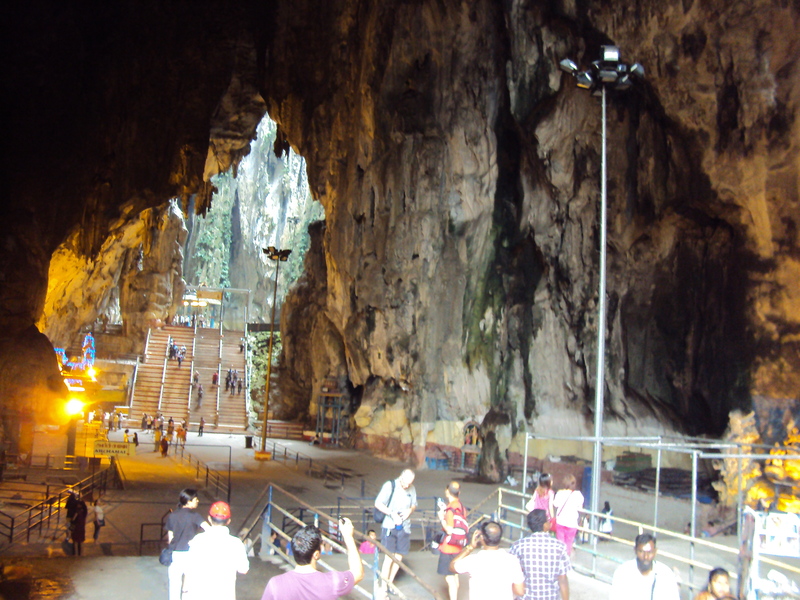 Batu Cave is the final destination of KTM train. Here are some pictures that I’ve taken in Batu Cave. I came back to the lodge on foot. From KL Sentral Station, I walked to Bukit Bintang area. I saw twin towers, so I followed the buildings. Unfortunately, I was lost because I suddenly couldn’t see the Petronas twin building. But, it’s interesting experience even I was lost, felt tired, and my legs were hurt. I could see situation, people’s life, and many things that never showed. “Are you lost, but you only have limited budged in your pocket to return to your lodge in Kuala Lumpur? Don’t worry! Keep looking at the high building, such as Twin Towers. Walk straightly. You’ll arrive to your lodge in some hours.” I give you good tips, but not suggested. Lol. In the third day, I made plan to go to Thailand. I heard about Thailand from some Indonesian friends that I met in the lodge. Their experience was interesting. So, I looked for information how to go to Thailand and which city I’ll go. I asked the receptionist, then I made decision to go to Thailand. I went to bus station, bought the Konsortium Bus Express Semenanjung ticket to Hat Yai-Thailand, it’s 50 MYR. Hay Yai is a city in the border of Thailand. As long as I know, there is no bus traffic to Bangkok directly. We should continue the trip to other place with another bus, for example Hat Yai to Phuket, Hay Yai to Bangkok, Hat Yai to Pattaya, etc. The fourth day in Kuala Lumpur. I asked my roommate to spend time together to Genting High Land. I put my backpack in luggage room at lodge because I have to check out at 11 AM. We used monorail at Bukit Bintang station to Titiwangsa station (2.10 MYR), and then went to bus station looking for “Genting” bus to reach Genting High Land. Genting bus was about 5.9 MYR. We walked around in Genting. We interested in Casino. When I entered the Casino, the police woman called me. She thought I am less than 21. Lol. Then I showed my passport to make sure. In the casino, we saw many people playing games but we didn’t understand how to play and the rules. Besides Casino, there are some indoor and outdoor games in Genting. But, I’m not interested in them. 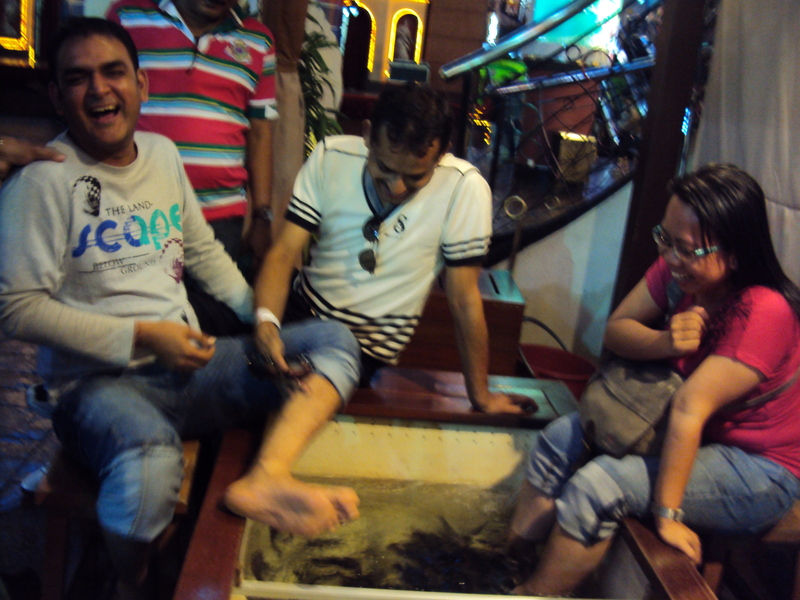 The interesting thing in Genting was I tried ‘fish therapy’. Have you heard that? There are tiny fishes in the box. We put our leg in the box, then fishes bite our dead skin. Tickled! Yes, you’re. And there are a bigger fishes. I also tried them. Hohoho, surprisingly for the first time, but enjoyed them at the end. Unfortunately, it’s 15 MYR only for 15 minute. I want more! 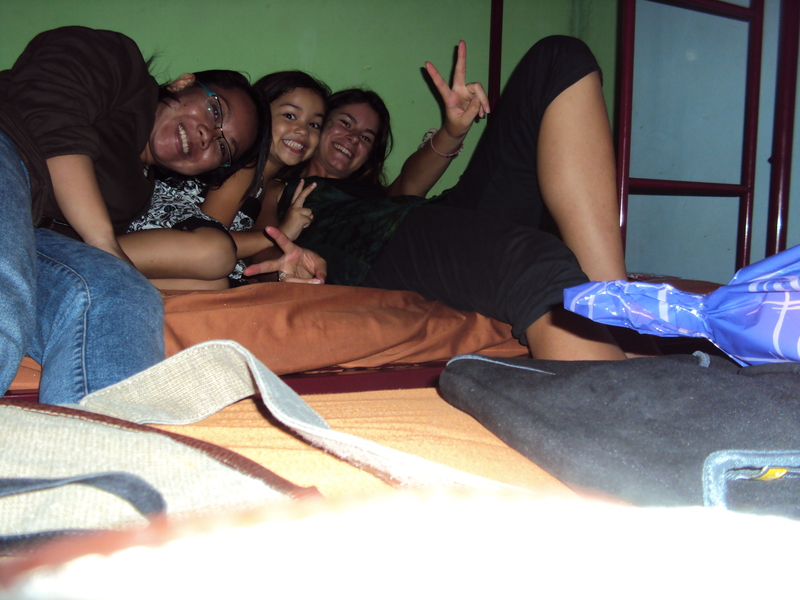 Then we went back to the lodge because I had to go at 11 PM to the bus station. I felt sad. It was a very nice vacation in Kuala Lumpur, but my time was ended. Good bye Sophie, a little cute Cathy (a daughter of the lodge’s owner), and nice friendly friends in lodge. Thanks for Sophie who teach me to use the electronic train ticket which I’d never used before. Lol. Hello there, been reading your blog. interesting blog. Im planning a trip to pontianak soon. any tips? Hello Nur… Thanks for the appreciation. Where do you from originally? Hmm, and what specific tips do you want? If you ever traveled by yourself, it will be easier. You can come to Pontianak by flight or ship (depends on your departure place). You can go to Gajah Mada street to look for accomodation (hotel or hostel). Hey. Thanks for the reply. Im from kuching actually. Im wondering if i can travel to Surabaya or jakarta thru kalimantan by ferry or ship. Is it possible? And as a local, what activities that u can suggest while im in pontianak. Im not a city person actually. I like to go to the rural side. You can use flight or bus from Kuching. There are Express airlines and MASWING. Check these out http://www.xpressair.co.id or http://www.maswing.com. You could to go to rural side or try some foods. We have a lot of variation. Surabaya and Jakarta also have traditional food. About Pontianak culture or tourism spots, you can check the information in other blog. Hi, thanks for the attention. It’s my pleasure to share knowledge and experience. Anyway, almost the articles here are in Indonesian language. I wish they could be translated properly and you can read it well. I’m glad hearing that you will recommend this webpage to your brother. Excuse me, I don’t know what kind of the service you mean. What did the messages say? appliquée sur votre panière après toi feront fonder officiels économies non négligeables même sur assurés petits escarpé. l’égard de chéques cadeaux ou pareillement profiter d’rare livraison gratuite !